This seaside resort is a modern and small seaside town in the heart of the Tuscan coast. The sea, Blue Flag for many years, is appreciated for its quality and crystal clear water. 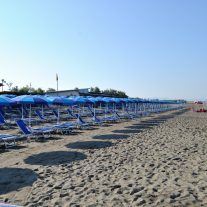 Marina di Bibbona is a major tourism destination for summer family holidays and it is well known for the high quality of tourist accommodation and the large number of Hotels, Residence, Apartments and Camping available to tourists. Marina di Bibbona is a seaside resort is also famous for its strong and its proximity to important medieval villages and its gastronomy.